As Women’s History Month approaches its final days, we continue the celebration by learning more about contemporary artist Laurene Krasny Brown. As a graduate of Harvard and Cornell, her academic and professional experience in the arts and education is extensive. The Copley Artist creates multimedia collages of cut paper and gouache, pulling from unexpected and diverse influences such as American folk art, architecture, and classical music. Laurene Krasny Brown never underestimates what can become of a piece of paper. For decades, she has found that tampering with the commonplace material is, in her words, “completely irresistible.” The artwork she creates that are composed in a square grid form stable boundaries, which allows her to have freedom when playing with color, shape, size, and surface texture. Though the square grid forms important boundaries, the artist also uses other recurring geometrical shapes such as circles and triangles, which allow her to use diverse techniques in her artful process. The themes in her paper-based art range from recognizably domestic items such as woven potholders, game boards, and model houses, to more abstract expressions in reliefs or free-standing structures. Through these representations of everyday objects, she hopes to celebrate small, daily activities and spark enjoyment in the beauty that is typically overlooked in an ordinary item. Not only does her art represent domestic items, the materials also have a domestic connotation. For example, Brown will use paper, sewing supplies, household hardware and, when needed, small toys. Brown continues to represent domestic items through still life compositions. She explains: “this subject allows me to interpret what is both familiar and profound about daily life at home.” Summer Bouquet was exhibited at Simmons College in the Trustman Art Gallery just last year during the Natural Force exhibition. While an artist in residence in France during fall of 2018, Laurene visited a local museum in Auvillar that holds a collection of its regional faïence tableware. Motivated by the pleasure tableware can bring to the dining experience, the artist created new artwork following her theme of representing everyday objects to celebrate the small, daily activities that make up life - which sometimes involve cleaning your plate! Prior to her career in fine art, Laurene authored, and in one volume also illustrated, sixteen popular picture books for children. Her academic and professional experience expands from the arts to children’s cognitive development. Now, as a full-time artist, she often participates in residencies all over the world as well as solo and group shows such as the #CollageNow: Analogue in an Instagram Era at Denise Bibro Fine Art in New York, New York and Real Time: A National Association of Women Artists at the Piano Craft Gallery where she exhibited Two Marnay Windows earlier this year. 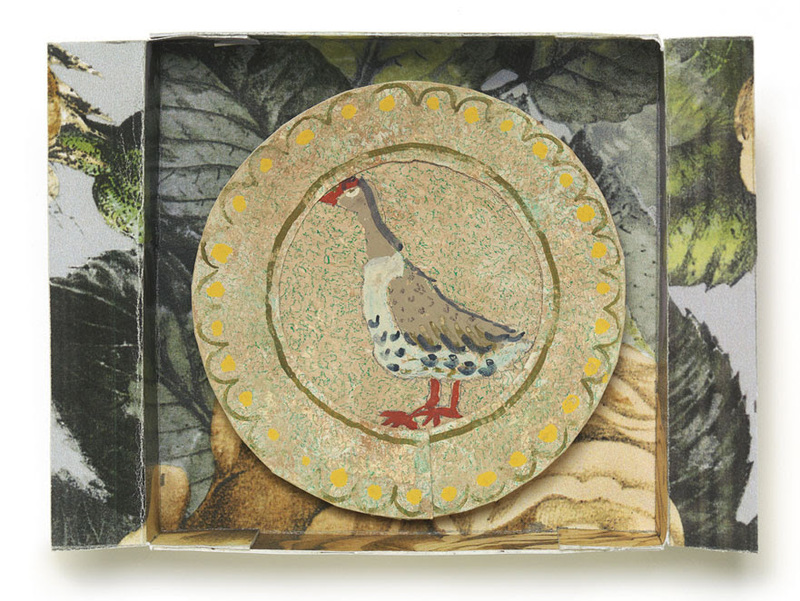 In just three days Laurene Krasny Brown will begin her month-long residency at the American Academy in Rome and we can’t wait to see what exquisite assemblages of paper she creates!